Direct trains such as the RE or RB to Cologne, Düsseldorf or Dortmund arrive on a regular basis in Bad Berleburg train station. From here it´s only a 4 min walk down Poststraße to the Bad Berleburg Markt und Tourismus e.V. Cologne is only a 1,5 hours car ride away, simply take the A4 Marburger Straße/ B508 in Kreuztal, then take the exit B54 towards Bad Laasphe/ Hilchenbach/ Kreuztal. Subsequently follow the B508 and the signs over K31, K45 and B62 to B480 in Bad Berleburg, the city center is well signposted. Cologne Bonn airport is approx 1,5 hours car ride away. Take the A4 Marburger Straße/ B508 in Kreuztal, then take the exit B54 towards Bad Laasphe/ Hilchenbach/ Kreuztal. Subsequently follow the B508 and the signs over K31, K45 and B62 to B480 in Bad Berleburg, the city center is well signposted. Bad Berleburg is an enchanting town located in the largest contiguous forest area in Germany, which is home to the Princes zu Sayn-Wittgenstein and is surrounded by a nature full of wonder. Giant bison, golden eggs, witch courts, Prince Castle and unique panoramic views, the picturesque town of Bad Berleburg lies in the middle of the Rothaargebirge Nature Park and offers everything your heart desires in your vacation and even a little more. The lovely town puts an unusual spell on everyone and is a real wonderland. It is dominated by its more than 750th tradition and the distinctive castle of the family of Sayn-Wittgenstein-Berleburg and is surrounded by an enchanting nature. Which is full of wonder, mystery and surprises is a stunning landscape waiting to be discovered with all your senses. Numerous hiking trails offer surprising and impressive input and views such as the newly created premium hiking trail Via Adriana: the way of the panoramas offers around 20 kilometres length a wide kaleidoscope of landscape: River loop, natural observation decks, meadows, pristine forests, pastures, switchbacks and narrow paths offer excellent wall experience. The trail is located in the lower “Edertal” (Eder valley) and opens up the two villages of Arfeld and Schwarzenau. It promises "Via" - so affectionate shorthand - extraordinary hiking enjoyment for body, mind and soul in a natural parkland. 20 absolutely varied kilometres, it runs through an extraordinarily beautiful piece of land right on the Eder. On the basis of the way history and good bus connections, several shorter variants are possible, so that every hiker can create his individual hiking experience. But not only the natural beauties and magnificent landscapes exert their appeal on visitors of the region. It is the varied diversity of leisure and recreation facilities away from the hustle and bustle of everyday life. Experience a beautiful, wooded uplands, with charming valleys and great views from the heights, visit beautiful cities and villages with many impressive architectural witnesses of the past. A tight-knit system of well-marked hiking trails allows each of hiking experiences can reach by which he may have long dreamed. Over 1,000 hiking signs guarantee security at every step. Find site exactly about Waymarks, local and distant, and distances. You can go on rubbing shoulders with roe deer and mouflons, bird sanctuaries and nature parks on excellent trails discover mountain forests and idyllic valleys exploring or have a picnic on a lush meadow. You are going to be delighted by the intact flora and fauna, the wild streams and natural monuments. You will find the trail network around Bad Berleburg, as well as the current hiking schedule on the website of the "Sauerland Mountain Association (SGV) - Department bad Berleburg e.V.". The Via Adrina offers outdoor fun on a well marked trail and even besides the quality trail, the region has a lot to offer. Before heading out, seek for local advice - Bad Berleburg Markt und Tourismus e.V. Poststraße 42,D-57319 Bad Berleburg or www.bad-berleburg-tourismus.de - the office will help to find a route to match your fitness and time frame and can supply you with maps and further instructions. The South Westphalian low mountain range landscapes Siegerland and Wittgensteiner Bergland (up to 800 m above sea level) with the Rothaargebirge Nature Park offer a variety of winter sports in the winter. From sledding to skiing snow hiking, Alpine and Nordic skiing. There is something for everyone’s taste! The Berleburg castle is one of the few castles in Germany continuously - inhabited by the same family (family of Sayn-Wittgenstein-Berleburg) in Berleburg for over 750 years. It is this atmosphere that "Animated - being", which makes our House so special. We invite you to visit many of our banquet halls, some of our guest rooms, the great Hall and the chapel in a guided tour through the Castle. Some 20.000km of signposted trails, mostly through forest spread across five nature parks are awaiting you. Mountain bikers and Cyclists can pic their favorites from dozens of routes and will be enchanted by every single one of them. This family-run, 5-star hotel in Schwarzenau is located on the site of a 500-year-old mill, a 2-minute walk from the River Eder. Schwarzenauer Mühle offers rooms with free internet, a 15-minute drive from the centre of Bad Berleburg. This family-run, 4-star hotel enjoys wonderful views of Berleburg Castle. The intimate Hotel Alte Schule offers tasteful accommodation in the attractive Oberstadt district. 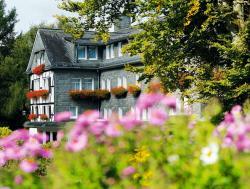 This family-run, 4-star hotel is located close to Schmallenberg in the Rothaargebirge nature park. It offers elegant rooms, an indoor swimming pool and a large breakfast buffet.